This is Part 2 of our first Jadaliyya Roundtable on Syria, moderated by Bassam Haddad and Joshua Landis, of Syria Comment. It features Steven Heydemann, Fred Lawson, David Lesch, and Patrick Seale. This post will be published on both Jadaliyya and Syria Comment. See Part 1 here. 2. What do you consider to be missing or exaggerated in the discussion/writings/policy on the Syrian uprisings? Heydemann (Q #2). Several elements of the current debate seem to reflect misperceptions or distortions, in my view. Within some policy circles in Washington, protests in Syria have revived the long-held dream of “flipping” Syria through regime change, and re-defining the regional balance of power in ways that would work decisively to America’s advantage. Seen from this perspective, support for the opposition is desirable because of the strategic opportunity it represents for America, rather than the possibilities it offers for Syrians to secure their own freedom. What this analysis tends to overlook, however, are the gaps that would need to be bridged to get there from here—that is, to move Syria through a difficult, dangerous, and complex transition to a stable post-authoritarian political order—and the very low probability that a Syrian democracy would have the political complexion that advocates of “flipping” seem to take for granted. Misperceptions or distortions of how a process of regime change would play out, or what its likely trajectories might be, have the potential to lead the US down a dangerous and counterproductive path. Far more effective, in my view, would be put in place a long-term strategy to develop the capacity of the Syrian opposition, and exploit the current opening to create a sustained, incremental approach to democratization in Syria, recognizing that we need to be in this game for the long haul. What has been missing entirely from recent coverage of Syria are references to Syria’s history of republican government and its experience of republican forms of democracy in the 1940s and 1950s. Syria enjoyed universal suffrage before Switzerland. It is the only country in the Arab world in which a Communist Party leader, Khalid Bakdash, was freely and fairly elected to parliament. While deeply if not fatally flawed, these historical moments nonetheless reflect elements of liberal democracy that should not be overlooked. The historical memory of democratic moments in Syria is a potential resource for the opposition. It has contemporary relevance. Yet it has not been touched on at all in the current media coverage of Syria’s uprising. Lawson (Q #2). At first glance, it seems easy to explain why the initial outbreak of popular disorder occurred in the environs of Dir’a: the history of restiveness and resistance to outside authority that permeates this corner of Syria; long-standing friction between Sunnis based in the towns—particularly in the comparatively new administrative center of Dir’a itself–and Druze in the countryside; covert and perhaps illicit activities carried on by unlicensed traders along the Jordanian border; and so on. But what were the primary dynamics that set off the explosion? An article published in al-Watan newspaper shortly before the demonstrations noted that government officials posted to rural districts of Dir’a province are no longer going to be given automobiles and drivers, even though functionaries in the city will get to keep theirs. Might local grievances like this have provided the impetus for the protests? Similarly around Latakia. Reports that shadowy groups of armed Sunnis helped to provoke the violence lead one to wonder what exactly precipitated the fighting along the western coast. Are poorer ‘Alawis rallying to the defense of the regime in the face of Sunni incursions from northern Lebanon? Or has dissatisfaction over changes in policy and spending priorities that accompanied the presidential succession alienated disadvantaged ‘Alawis in the provinces from their well-connected co-religionists in the capital? And more important, what industrial, commercial and agricultural circumstances are present in these two parts of the country, which might have aggravated popular disaffection? Has the drought that is decimating the villages of Syria’s northeastern plains inflicted similar damage on the hard-scrabble grazing lands of the south? Are employment prospects around Latakia markedly dimmer than they are in Aleppo and Damascus? Lesch (Q #2). There seems to be, as expected in this sound byte world, exclusive coverage of the extremes, either those who are against the Syrian government or those who support it. Each viewpoint has been manipulated by its own sets of supporters to fit political agendas. Ultimately, it will be this silent majority, including the business, religious, and tribal/clan elite who will determine whether or not Asad has done enough. Seale (Q #3). I think what’s been missing from most of the writing about the crisis has been recognition of the way President Bashar’s mind-set has been shaped by the many crises he has had to deal with in his decade in power – and which he has managed to survive, clearly a source of pride for him. These crises include George W. Bush’s war on terror after 9/11; the Iraq war of 2003, and the knowledge that had America been successful in Iraq, Syria would have been next, as the neocons had planned; the 2005 crisis in Lebanon triggered by the assassination of Rafiq al-Hariri, and the “plot” (by the US and France) to unseat him at that time; the Israeli invasions of Lebanon in 2006 and of Gaza in 2008-2009. What’s been missing in much of the comment is Syria’s sense of vulnerability to attack. Its allies, Iran and Hizballah, have faced Israeli attempts to demonize and destroy them. Repeated efforts have been made to disrupt the Tehran-Damascus-Hizballah axis, seen by many as the main challenge to Israeli and American hegemony. In his rambling speech, Bashar’s argument was that he now faced a new “conspiracy” similar to that of 2005. This time the aim of the “plotters” was to ignite sectarian strife so as to fragment Syria’s national unity, weaken it and bring it down. In raising this question, he was putting his finger on an enduring concern of the Alawi minority, and indeed of their Christian allies, faced by a resurgence of Sunni Islam. Regarding much-needed forms, Bashar said something to the effect that he had intended to introduce reforms from the moment he took office in 2000, but that confronting the various crises and dealing with the ravages of the four-year drought had somehow got in the way. It was a sort of apology. His priorities, he affirmed, were stability and seeing to the needs of the citizens. Those who know President Bashar say that he has a stubborn streak in his character, no doubt inherited from his father. He doesn’t like to be pushed around or be seen to yield to pressure, whether internal or external. That may be why he has left to others the task of elaborating on the planned reforms. [The third and final set of responses will be posted on Friday] See Part 1 here. The question is how Bashar with his majles of hypocrite clowns ,stalinian laws,one party system ,deeply sectarian minority regime,poor socioeconomics and human ,poor media freedoms indicators (in the lowest group at the arab and regional levels),kleptocraty,family-cracy,narcissism,own posters addiction,imposed cult of personality,khomainist theocracy’s style of divine propaganda,endemic corruption ,going to struggle with 21st century history. It seems that he decided to simply sit it out and hope that the 21st century is just a wave that is going to pass. We all know that he is not the kind of person who is affected by passing waves. But just to be on the safe side; the 21st century motion is under study by the regional command executive bureau of the Baath Party and they will send a personal report to his excellency with recommendation on whether it actually exists and then and only then will he initiate a white paper to see if it exists as a trend or if it has long term implications to the well being of the Syrian people. Nafdik ,they should establish the anti-conformist international with members such as: North Korea’s dictator and sons ,Gaddhafi and sons if he could pass this wave too. I wonder how will Bashar supporters spin this one around. Regardless of my philosophical beliefs.I’m a nostalgic of the cosmopolitan Syria of my grandparents.i never called for bashar’s sectarian militias or other than them to kill millions of syrians as you and alikes on this forum called for. All those people who are critisizing Bashar need to understand that he doesnt give a rat’s behind about what you all think. He only cares about his people, and frankly, that’s all he should care about. Bashar is the Best President that has ever happened to Syria, after his father. He and his father, Hafez, have changed Syria for the better. All the minority groups in Syria who had no representation and were abused befoer Hafez came to power, should be grateful that he changed the whole system, and gave them rights. Hafez built Syria, and Bashar is finishing the job. It doesn’t take the blink of an eye to completely modernise such a backward country, and make it look like New York, LA, or even Australia. It has come a long a long way, and in due time it will even be better. THE PEOPLE WANT BASHAR AL ASSAD!!! ALLAH, SYRIA, BASHAR W BASS!!! We are with you all the way Bashar! We love you! you call this a demonstration !? if these people honestly sought political rights, why don’t they film themselves from a higher point, a roof-top of a building, or zoom out so we can estimate their numbers and hence see and understand what they weigh politically !? see how the camera proudly moves around and zoom in & out. Australian ,your sect/community is not damned and Bashar is not the end of syrian history. Syria will make its democratic transition that must give same rights and same duties for all syrians. Syria wont be a theocracy. Well that was the best joke ever. What exactly did Bashar or His Father accomplish for Syria, other than losing 2 wars with Israel, destroy political life in Syria and destroy the economy. Go ahead I dare you, present one significant accomplishment that had a positive effect of Syrians way of life today. If you’re so fond of the way Syria is, why are you in Australia ? How do you explain what’s going on in Syria these days ? be specific, I would love to hear this. In the 50’s and early 60’ Syria had private banks and accredited private universities; accredited and great public universities; a Christian prime minister; a good economy; very little poverty; women had more rights and freedom; political freedom; and a middle class. How do we compare now? We have private banks; unaccredited private universities; lousy public universities; a controlled economy; no middle class; women almost have no rights because of religion zealots; no freedom of any kind; and no middle class. We had the same enemy as we do now. Israel is still around and has taken more land from us. Actually, Israel has become a mini superpower while we are powerless to do anything against them. Don’t you think it is insulting for every Syrian that Israel can come and bomb us anytime they want and we don’t respond to them? Not even a single bullet across the Golan. Finally, you have every right to love Bashar. But like we told a lot before you, we’re not interested in propaganda, if you have something to contribute to the discussions please do, otherwise spare us. Many people underestimate the danger of Wahhabism because they don’t understand what Wahhabism is. Wahhabism is a religion that refuses to coexist with any other religion or belief, no matter how close it was to it. They are similar to the Kharijites. Just like how they battled with Hamas in Gaza, the Wahhabis in Egypt are eventually going to start a civil war with the Muslim Brothers and the other Islamists. It is only a matter of time before Egypt falls into sectarian bloodshed. The fact that Islamists keep denying that the minorities were persecuted in Syria before the Baath does not help their cause at all. When you say that the 1940’s-1950’s period was great for the minorities, how do you expect people from the minorities to take you seriously? It is like a Nazi trying to convince German Jews that the Nazi period was good for them. I told you guys before to read the book called مذكرات أحمد نهاد السياف. Read this book and try to understand the history of your country before launching demagogic sectarian attacks at the Alawis and Hafez Assad. Try to read the history of Hafez Assad from neutral sources and try to understand what he faced and why he did what he did. If you would like to know what Bashar and his father did for Syria, i will be glad to pull you out of you ignorance. First, when Hafez al Assad came into power, he changed the whole of Syria. He built more schools and universities. He gave women rights to explore things they were unable to do. Women had the rights to enter into male-dominated professions, such as the Army, the navy, the police force, medicine, law… Women gained respect and recognition in a patriarchal society. Secondly, Hafez got rid of the specification of which muslim sect you belong to written on passports. It had to be stated what you are, Alawi, Cuni, Shia… as you SHOULD be aware of, this caused problems and hatred, because you were publically known of who you are. He got rid of that. That is why now it only states, eithet Muslim or Christian. Nothing else. Thirdly, Hafez sponsored every child in Syria. Those with no homes and families. He fed hem, clothed them and educated them. Ok, the positive effects on Syria today. You said you dare me? Dare accepted. Concerning the broader rights and freedoms given to women, they are represented hightly in government, and in other proffessions. Women are now members of large corperations and some even own them. Discrimination among sects… Not so heared about these days as it was before. I won’t deny that there IS, but i will confidentlly say that it is not extreme. On Bashar. What more do you want than the fact that he does’t allow foreigners into the country and take over, like they done in Eygipt. Eygipt is full of Americans and Israelies. the last time i checked, that is what Bashar is trying to prevent in Syria. On to another suject. You ignorantly asked, “If you’re so fond of the way Syria is, why are you in Australia ?” You are right. I am fond of the way Syria is. And i love Syria with all my heart. I have been itching to go there for a while now, but i have my studies to think of. I cant leave in the prime of my university education. I will love to live there! This is the most pathetic question anyone has ever asked!! Just because you love a country, it does’t mean you have to go love there. I love France, Italy, Lebanon, but i wont go live there. I am as fond of Australia as i am of Syria. I was born and raised in Australia, and i will defend Australia with all my heart. I am Australian. But that doesnt mean i cant love and defend my family’s country. Who knows, maybe one day i will go live there? You sound as though you dont like Syria, and you really sound like you can’t stand the President, well no one is telling you to live there. You are entitled to your opinion, as i am of mine, so dont waist your breath telling me where i should live. Even if i lived in America, i will defend and be fond of Syria. And you call the fact that i said that the minorities were abused an “out right lie”? What do you know? Were you or your family a part of the minority group? Well obviously not. And that quote? seriously, that is what you call propaganda. You are right in one thing though. I do love Bashar and his Father. I really do! But as long as what i say is the truth, i will not spare you, so dont call it propaganda. Jr’s speech proved his authoritarian, unpredictable, and non-democratic style in decision making, and his deceitful intents! Earlier statements by confident, Aunty Sha3ban and the vice president, of a positive speech, heralding quick reforms, have proven them both uninformed and irrelevant! This means that, Jr himself is either not mature enough and /or too narcissistic to embrace collective decision making, a part and parcel of democracy. Why then, sending thugs with batons to terrorize them? A rhetorical question! Thank you Majhool and shami for the links. It looks like we are going down the same path of the 1970’s-1980’s. Those Wahhabis are not going to back off, and the regime is not going to surrender to them either. I personally somewhat like what is happening. The eradication of the Muslim Brothers from Syria had positive effects on the country, and the eradication of the Wahhabis now will be also positive. Over the last 20 years, Wahhabism and Islamic extremism were growing rapidly in Syria. Had the Wahhabis not acted now and confronted the regime, they would have become a much dangerous challenge later. Getting rid of them now while they are weaker is not a bad thing. Of course, I would have preferred that Islamic extremism was eradicated by the power of education and enlightenment. Unfortunately, this has not happened, and Wahhabis now are a dangerous reality in Syria. If they stay, they are going to cause much trouble later. We have to acknowledge the fact that a vast majority of the syrian population support the Assad reign and love their leader,Basher, dearly. However, we cannot ingore the fact that protestors are demanding ‘freedom’. What does this freedom constitute?? Have these protestors specified what it is they actually want to change, have they mentioned the specific rights and freedoms they are being deprived of?? NO, the rebels are demading freedom when most of them probably dont know the meaning of freedom, to know if they’ve even been deprived of it. As a spectator, i have seen that the protesting rebels are only keen on one thing…to overrun Bashar from his seat as the leader of Syria! They have not tried negotiating with Bashar to come to the terms of the freedom they are seeking, they have not sought any kind of compromise or any form of communication with Bashar. It seems that the rebels are not seeking law reform that will ultimately regain their freedom, but rather they are seeking to demolish the Assad reign from syria. Do they know if a new leader will give them the freedom they are seeking or is their only goal to de-seat Bashar?? More lies and corruption of the ‘Syria Revolution’ exposed. They are being sponsored by politicians in Lebanon, plus more fake videos surface. Did i forget to mention that there is free education and health care systems in Syria, one of the lowest tax syestem that only taxes large corperations. Did i forget to mention that the price of necessities such as bread, flour, sugar, fruit and so on, is constantly reviewed by the Assad govt and prices lowered in these growing eco times, to ppl that arnt so fortunate are able to afford to eat. Now to the fake medi attention, and lies. Broaden your horizons and dont just look at the media channels that are broadcasting lies, go on to youtube, and see how the videos have been ammended to their liking! Should i mention the ppl that have been arisen from the dead after they have been shot? The man that was shot in the face in Yemen, that was “supposedly” killed in Syria, and the man that majically came to life as the fake blood was washed off his face. WAKE UP YOU IGNORANT CHILD!! You people are soo funny! Im not arab, not part arab, nothing to do with arabs, and i can see that Bashar is possibly the best President that Syria has had. I have done my research,watched UNBIASED shows, translated and understand that there is conspiracy. I have seen the millions of people rallying FOR the President, hence i belive that the majority love him, while the minority dont. If i was an arab, i’d love to have him rule my country. I totally agree with you. Im not syrian but i have watched the demonstrations supporting Bashar and it is totally obvious that 99% of the country love him and accept him as their leader. 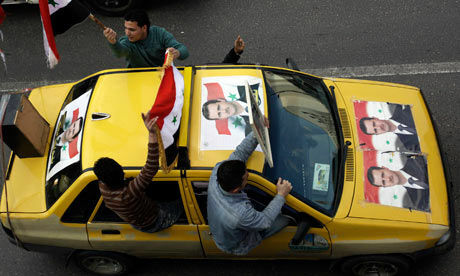 The minorities should seek reform rather than plot attacks againts Bashar to overrun his regime. Ive been to syria and it is a country full of freedom…and from what ive seen Bashar is a great president as his main priority is his people. He has even started to review and reform laws to provide more freedom and rights for his people even though he believes its all a conspiracy! I just dont understand why people are silent about 1982 Hama Massacre. The new Generation does not even know what it meant. How can the world Still keep silent about that? It will not happen in my country in any case, cause, thats why I believe in Democracy, whatever. I feel ashamed of you Syrians, being so selfish and cowards, for being under this Regime althrough these decades. Idiots who don’t know what happened in Hama shouldn’t speak. I wonder what Mini would have done about Muslim Brotherhood terrorists in the 70s and 80s in Hama who were killing thousands of innocent people because they were not Sunni Musllim, and because they wanted to rule the country with religious laws. Would he have said “Even though you are criminals who are killing innocent people and want to impose evil rule over the country and wont stop until you do, I will leave you alone?” You’re an idiot. Mini,most of those do not like Asad but their hatred towards the Islamic civilization could explain this pro Asad stance. Paradoxally,they are afraid from the islamization of the syrian society that happened under the Asads. They are told that we are going to eat them and that the regime protects them from us. So is the result of 4 decades of sectarian regime. I take anything, I mean anything versus Taliban or brother hood. Funny how the media portray it : He is killing his own… butcher. In Algeria the islamist were killing their own for 10 years and they even reached France in certain years. At least Assad got to the roots immediately. I’m sure they were victims but fine combing in such delicate matter is very difficult, especially if security is at stake. Bush waged two wars Iraq, Afghanistan to protect the security of his country. They’ve changed the law so FBI can barge to your home, pick you up, innocent or not and send you to Guantanamo without trial or trial by military court. Bradly Manning is in jail being tortured every day. Every morning they force him to walk naked in front of his inmates, because he told the truth. Democracy or not, all the same, depends on who does the atrocity, his forgiven. If the Syrians could justify the Assads in the Hama case, where 2/3 of the dead were women and children and If Syrians choose this path to remove a cancer from their nation, They have to pay too much. This will lead to the making up of more Golan Heights. And there will not be a Syria, to call as a nation. It is very clear in the history of each nation that Blood of Innocent people will shove away every thrones. No ruler in history will make it to the end if his hands were dipped in a cup of blood of innocent people. The unclaimed death pits of each nation will open its mouth once again to drink the Blood of its Fury. If you can justify this mass murder using Heavy artilleries, Bombards and Cynaide Gas upon Syrian People by their own Father figure, what would you say about Hitler? He had atleast not touched Germans. Fight for Freedom for Democracy or Stop Living like this. Please stop posting comments that insult the intelligence of those reading this Blog, most of us here have at least one PhD. Syrian education is free and mandatory until the 9th grade!!! Now let’s talk about the health care system. – It’s not totally free anymore, they charge you now for certain services. – Patients are regularly asked to buy their own medications from pharmacies outside the hospital, either because the drug needed is out of stock ( in many cases stolen and sold by the hospital officials ), or because the drug available is of poor quality. – Patients might be asked to wait for a month for a CT scan (of course they can -and encouraged- bribe their way into reducing this wait period). – The quality of care is very poor that most citizens prefer to be hospitalized at private hospitals or if they can afford it travel abroad for a better care. Last year one guy got shot right as he went out the back door of Aleppo university hospital, he died 3 days later …. he was shot in the foot!!! One time I noticed a nurse was putting a sticker on the syringe and then writing the name of the patient on it, I asked her what she was doing and she answered: we do that for patients that require several shots a day, we use the same syringe to cut down on expenses!!! So, that’s your health care system. The tax system you have in Syria is a joke, none of the big corporations pay any taxes due to corruption, and so most of the tax revenue comes out of the little guy’s pocket. The government is also trying to move away from subsidies that are bankrupting the state (and rightly so), if it wasn’t for the current wave of unrest the prices of most commodities would have been risen even more (inflation in Syria is in double digits). As for the media, the only channel I watch regularly and trust the accuracy of their news is Al Jazeera, I would ask you to stop watching State TV channel and check facts yourself instead. Yes there are many fake videos out there, there are a lot of true ones aswell, was the one showing govt thugs attacking with clubs/belts and insulting demonstrators a fake ? was the testimony of the MP from Daraa in a Parliament also a fake ? The FBI can’t barge into anyone’s home without a WARRANT from a FEDERAL JUDGE, they certainly can’t detain you if you’re innocent, and never was a U.S citizen arrested in the U.S and sent to Guantanamo, ever. Bradly Manning was stripped naked after he threatened to kill himself using the elastic band of his underwear, it’s harsh treatment sure, torture as in what happens in the basement of any of the Syrian security branches ?, I’m surprised you’re even comparing! (( It’s not totally free anymore, they charge you now for certain services. In the US we all pay through donation to buy cat scans, MRIs and other equipments for our community hospital, when was the last time Syrians living in Syria collected money to support their hospital establish a cardiac cath, a cancer program , never that i know of , the only thing they do is to build more churches and mosques, provide food for the poor, did they ever think of providing a scholarship for a poor student , No God forbid they might be considered good citizen, That is the responsibility of the government and Bashar Assad , Public hospital are in bad shape because the people do not help and the administrators are stupid and corrupt , local prosecutors should take care of that, by the way my father had dialysis in Syria for 4 years and if it were not free we would have not been to afford it at that time , 30 years ago . ((- The quality of care is very poor that most citizens prefer to be hospitalized at private hospitals or if they can afford it travel abroad for a better care. and my mother almost died from MRSA an infection she acquired in the hospital, do you know how many people die in the US from mistakes by DRS and hospitals , look it up it is astounding , you will not want to be in the hospital. I agree with you about the Tax system , it is terrible, and unfair,and need an overhaul. that’s your health care system. One more thing, My Uncle had to go to Lebanon to have Radiation therapy because there is no radiation machine in Latakia, or Homs, recently a friend on ours opened a Radiation center in Homs that cost significant ammout , the problem in Syria is that there is price control for health care so he could not charge even foreign nationals more than what the government set for him and that is a problem with the significant investment that he made, Syria would be better off letting him charge what is customary in Lebanon but in return he will treat 10% of the people without money free, that will decrease the pressure on the public health care and provide funding for him to improve his facility. and provide jobs . Syrian medical students score 99% on their tests because they study hard, and they study American textbooks, not because of the quality of education in our universities, I know because I’m one of those students (ask your friend how he prepared for his USMLE) 🙂 . It sounds like you’re a generation older than me, my uncle did study in the university of Damascus and then came to the U.S and he did well back then, but the situation changed a lot since then, the quality of education nowadays is horrible (though in Damascus it’s still relatively better than the other universities), for instance one of my friends graduated with excellent grades without ever seeing one patient, not even once, during the 6 years we spent in med school he attended a total of maybe 10 lectures and never did any rotations, he’s one of hundreds graduating our universities. What I’m trying to get at, while we have wonderful systems in Syria, on the ground they are disastrous because of the level of corruption we have, and the mismanagement of those who were put in change of these programs when they didn’t have the bare minimum knowledge or experience to run them, so instead of advancing them, they ran them into the ground. The government have to spend/invest a lot to make these programs effective again. But in their current shape they’re not a source of pride. And yes I agree the community must chip in, we have enough mosques and churches, those millions are better spent somewhere else. Corruption can be fought by good salaries for government employees and transparency in contract bid opened in a committee and published in the newspaper for challenge . O Shalish and Makhloof, Syrian people are not sheep. Also, a very disturbing video, which we have not seen such cruelty in previous revolutions. The hit the young guy who is hit of gun shot in his leg, they drag him again and hit him hard…this in Homs the birth place of the president wife. You think that 50 people should affect the policy of the country, don’t you think you lack convincing numbers. You say that i “insult the intellegence” of those reading the blog, and yourself, because you have PHDs? Ha! This is truly funny. Just because you have a PHD, it doesn’t exempt you from ignorance. I may not have a PHD as we speack, but when i graduate from the Bachelor of LAW, at the end of this year, i will have one. And yes, i do not exclude myself from what i said earlier about ignorance, but at least i am man enough to admit it, unlike you! My uncle and his two sons are lawyers, in syria. My whole family in Syria is educated, and NO, they are not wealthy. You claim that public school education is ‘miserable’? Fair enough. That must mean that my uncle and my cousins are fairly ‘miserable’ lawyers. Oh no! You will now say that they must have bribed universities to take them in, sorry i should have known!. And considering you are so fond of the American schooling system, why not, if you havent already, send your kids there, if you have any? At least now we know why you are so anti- Bashar. You are a US orientated person! Well then why not try to do something about the education system, if you are so worried about it, and donate money to help them? You say that people have to wait for a moth for a ct scan? Here, in Australia, we have to wait maybe the same, unless someone before you is in a worse off condition, then you are pushed even further down the line. I have a friend of the family who is living in Chicargo. He needed pen heart surgery. It was critical. He had to wait 4 months. Untill the person befor him died, then he took his place and had the surgery a month earlier. In Australia, i had to wait 2 weeks to get ex-ray results back. I think i should start a protest. The last time i cheked, someone can die if they were shot in the foot…something called loss of blood. And you say that you watch Al Jazeera? That is all the confermation i needed. If you have not realised, that is the one that is posting all the lies, or exaggerating the truth. I have done my own research, yes i have. And i thank you for such a suggestion. Now i suggest you do the same. Maybe if you start watching state tv channels, such as the Syrian T.V, you will see all the support Bashar is getting. Al Jazeera is only posting the negatives. All i have to say to that news channel is to put its biassed asside and post both sides, so people can see the truth! I hope you will broaden your mind, and see the other side, as i have, and i am consistant with my thoughts and beliefs. I am not trying to insult your intellegence, but even though i have not achieved my PHD as of today, i still possess the knowledge required to understand what is REALLY happening! I forgot to mention that reform on the medical system and education system is on way, if people will only allow the government to take its time to create these reforms. Rather than being hostile toward the government, the people who are against it should be doing all that they can to help areas that need help, and thus it will show the government that action must be taken as soon as possible. This will not only create unity, but also create a powerful Syria, that is immune of the outside parasites which are constantly trying to destroy it. It is not Bashar that is ordering the army against the protestors. The army and the citizens of syria are acting by their own will to protect Bashar’s regime. Bashar is ordering his people to stop the violence and is starting to review laws and plan for reform eventhough he believes the protests are a form of conspiracy. Bashar is not to blame for any bloodshed, it is the people’s fault. I cant believe that you are comparing Hitler to Bashar! They have nothing in common…Bashar has never ordered to killing or faulse imprisonment of any innocent person!! Oh and just because Hitler didn’t touch the germans it justifies his actions against the jews?? You missed the whole point of my “don’t insult our intelligence” remark. What I meant by that remark is, we’re smart enough to look at the state of Syrian schools and hospitals and see they are inefficient. They are not something to be proud of. You thought I was defending myself against your personal attacks, be assured I was not, you can attack me all day long, I really truly don’t care. Like a lot of other Syrians on this blog we attended Syrian public schools and universities, they were miserable and yet we are doing OK to say the least, is our success a product of the quality of education we received ? no, it was a product of our hard work. So if your uncle and cousin are brilliant lawyers it’s too a product of their hard work. Same with Education, for universities a good measure would be the number of scientific papers they publish and what kind of research they conduct in university labs, we have no research and publish nothing of scientific value, so the universities are not in a great shape either. You suggested I help out by donating, who exactly will I donate to ? the corrupt officials in the government ? If you bothered reading my other responses you would have noticed I said I’m not against Bashar as a person, I’m against him as the prisedent of Syria, mainly because he failed to implement any major reforms since he was crowned 11 years ago, if he changed his policies and truly started reforming I would support him, it’s that simple. If you feel that you are not getting your rights in Australia then yes you should protest, it’s your right to protest and the Australians wouldn’t beat you of arrest you and harass you, would they ? will you protest if everything in the country is failing ? I think you will. He was shot right outside the hospital and died 3 days later, due to acid-base imbalance. Read what I posted earlier. As for Al Jazeera exaggerating, wow man, really ? of all the news channels worldwide I think Al Jazeera is the most credible source of news. Can you please share with us those controversial reports and the lies Al Jazeera is spreading ? By the way I do watch State TV and keep up with Facebook, Twitter and Youtube, of all these, the least reliable source for news is State TV, because sadly it’s just a pure propaganda machine. The day the Daraa events started, State TV claimed a gang of thugs attacked the city, when clearly it wasn’t a gang of thugs, and that’s the testimony of one of the Syrian MPs who was present in Daraa at the time. Finally, how can you respect the Syrian regime after what happened in the Parliament, the whole planet was watching Bashar’s speech and I truly have never been more embarrassed in my life. Do you feel those MPs can represent and protect the interests of the Syrian people ?. Are they really the best Syria has to offer ?. I doubt it. Anyways, Good luck with your studies. I think you have some very solid arguments. The last time I checked, a PhD is not a pre requisite to comment on a blog. It also doesn’t confirm your overall intelligence. I think it is time to take your blinkers off and take a good look around. Assad’s views on the current protests in Syria being a conspiracy, sounds right to me. Who do you think is behind this ridiculous “Syrian Revolution” campaign – a disgruntled corrupt ex vice president, a power hungry uncle who wants to take over? They would just be the ones in the spotlight so to speak. Don’t you ask yourself who is behind the door controlling and funding all of this? I think you’re letting your hatred for the President cloud your vision. There may be some truth in the Syrian health system not being A grade, but most people are able to receive the health care they need which is far better than some of the countries around the world. Look at the people living in the slums of India or people living in some countries that do not accept a patient even an emergency one at that until they make most, if not all the payment required for their healthcare. Now on another note, Syria has one of the lowest crime rates in the free world. Listen to what people are saying – they feel safe, as safe today as they have ever been. The sect protesting in Daara is a frightening one with power -hungry people behind them pulling their strings. I would not like a government with that particular sect behind them controlling my country. Syrian Almighty, I have watched many videos about the protests. The media is supposed to report on actual events, not ones that are fabricated. My 11 year old son picked up on the protesters miraculously coming back to life, before I did. With the power and money Al Jazzera has, they should have the courage to report actual events. In Canada you may wait 6 months to be admitted for an operation.! No one complains, no demonstrations but ‘free’ and endless debate on TV with no solution. In Canada I guess emigrants don’t dare to protest. When you send a complaint, it is politely accepted and nothing happens. Some say that Canadians are like sheeps, they just accept and shut up because they feel ‘proud’ of living in a ‘democracy’ and be able to vote. At the end of the day, one wonders what is best. As for the education in the US. I am not sure if your primary and high school education in the bad system of Syria did not make you smarter than the pampered primary and high school education system in the US. I also guess you live in a ‘nice’ neighborhood’ where there is no violence at school. The US TV programs and cultural openness to the world is very low. I guess Syrians with their bad TV are more open to the world that this new generation of US kids fed with Ipod, Ipad and flashy-empty TV programs. I understand that you possibly know more about the health and education systems in Syria than i do. But that doesnt mean that you should disregard the fact that change will come in due time. If people will let the President do what he can to change things, rather than hysterically lose the plot and say horrible things about him. Considering you think that Al Jazeera is the most credible source of news, that explains so much. I will gladly tell you a couple of the things that it had done wrongfully. Considering my father only understands arabic, that is the channel we constantly watch for news, up until now. First, it has supported all the false videos portrayed of the government, it is clearly against the Bashra Government. Second,for the past few weeks, all i see are negative reports, none about the pro-government rallies. It almost remindes me of the channel 7 news here in Australia. We had a pro- Bashar rally on Sunday, and 7 news showed less than a minute of it, then showed an image of someone burning the pictuer of Bashar. I dont know about you, but that proves to me that even here in Australia, they prefer to publicise negative footage, and twist things around, making it look as though we were anti-Bashar. I dont doubt it! I watched his speech, and frankly i loved it! i loved what the ministers were doing, and i was chanting along with them. I was not embarrassed! I was proud! I have never been more proud! YES! I RESPECT IT STILL! They were showing him that no matter what, they are behind him. Im pretty sure that neither Obama or Guillard will ever see something like that. They are not loved or revered as Bashar al Assad is. And did you notice all the people waiting outside in support of him? Or did Al Jazeera say they were against him? I thank you for wishing me luck in my studies. Who knows, maybe one day ill be the Prime Minister of Australia, and we will have a strong allegiance with Syria? of course I’m just kidding, may you never need to visit a doctor. I think our kids are more open to the world because of our culture, in my opinion we are more engaged with our surrounding than the average American due to the way we were brought up, take Syrian kids who were born here and never visited Syria for instance, they’re still more engaged than their American friends, so the way I see it parents play a major role here. To be fair the school system in the U.S is like you described it “pampered” although you do have the choice to take up more advanced and honor classes. I suggest you look at these. In Melbourne at Parliament. And there are heaps more. I agree,I thought President Bashar’s address to his nation was a strong positive one. He showed solidarity and strenght as any great leader should. Not only were there many people waiting for him to cheer him on after his address, but they were wanting to touch him as many in the western world would do for there idols – musicians, actors and so on. President Assad is looking for unity and solidarity in the arab world, It would be nice if everyone else did too. I wish you the best and if one day you do become the Prime Minister, the nation will be better for it. I would also like to highlight that there were MILLIONS – up to 15 million in a PRO-BASHAR rally in Syria – i wonder, that just might look like a country who loves and respects there leader. Not to mention the many Pro-Bashar rallies happening all over the world. Toward the end of Bashar’s speech, he addressed the public chanting and re directed it at his people – “You say God, Syria, Bashar, I say God Syria and my people” They chant that they will give there souls and life to him, he will do that for there people. I ask you, who else has ever said that? Go back and actually live in Syria. We’ll give you $5000 each YEAR (not month) to live on (per capita GDP), and then we’ll see how much of a President-for-Life supporter you will be. If Bashar is very popular why do you think in his 11 years of rule he did not allow free elections? Thanks for your comment! And it is true, millions of people also surrounded his car, trying to touch what ever bit that they could. They truly love him. Please do give me $5000 each YEAR , i will be honoured to live there, in any state, as long as Bashar is President. I will remain loyal to him for the rest of my life! Actually, his 11 years of rule DID allow free elections! That’s why he won! Im pretty sure that why millions are rallying in SUPPORT of him, and ony a minority are agains him! And that minority are made up of outsiders, and parasites attempting to destroy Syria, and make it a corrupt country, like Iraq, infested with American soldiers! Australian,do you agree with me that the day will come when the same people who applauded bashar will spit at him. (especially the noisy opportunistics ,majles members,clerics ,ministers,ex ministers, and other well connected to the regime). Most of the time unkind dictatorships are loved by the oppressed people,but this love is not rational ,it’s more like a psychological disease. BTW,Ali Saleh the yemeni dictator ,despite the organized opposition he faces ,succeeded to bring more supporters in the streets than the mostly staged demons for the menhebak dictator ,Gaddhafi has enough people who are ready to die for him. I’m not sure that the same number of syrians are ready to die for Bashar,even within his sect.I dont think that the syrian army will be able to suppress a massive uprising that include Aleppo and Damascus. Shami, NO I DO NOT AGREE WITH YOU!!!!! How dare you even suggest a thing like that? Firstly, if our love for Bashar is a psychological disease, then i am happy with, and greatful for the disease, and may i never find a cure. And second, i think you have been blind for the past few weeks. Have you not seen all the millions of people supporting him, chanting ” with our souls with our blood we will protect you Bashar” ? And no, that is not an act, that is what you call real devotion and love! You speak of gaddafi, well bashar is nothing like him. Anyway i firmly believe that ppl will never spit at bashar, but they, including myself, will gladly spit on ALL his enemies! Yeah Syrians living in Syria will never spit on Bashar, this video is a collection of clips shot on Mars. There are news that the syrian-regime is establishing armed militia committees who are expected to attend prayers and use violence against anyone trying to initiate a protest after prayers in mosques or churches. While not yet verified, if true, would you be willing to join these militias and attend your local mosque or church service and use force against those minority of Australian-Syrians who dare start an anti bashar protest in your town down under. Or would you, then remember that you are Australian, whose love of country demands that you do not commit such terrorist act. DO NOT Bother answer, for I am not expecting logic, nor common sense. You read enough of my comments, you know I’m not against people loving Bashar or claiming that a lot of Syrians do. However I’m against the ALL, EVERY, NEVER, ALWAYS, FOREVER, ETERNITY, INFINITY & BEYOND remarks, they’re by definition illogical. Oppress your people long enough and they will take a dump on your grave. I beg to differ, these words, in the context you are describing are not only illogical, they are cultist, demeaning, and dehumanizing to the chanters themselves. What is freedom? I’ll like to ask some of these demonstrators what they mean. Can anyone help? Specific examples please. As reported by L’Orient- le Jour, curiously the US advise the US citizens not to travel to … Lebanon, due to insecurity concerns. They say that airports and borders could be shut down without notice. I will not reply, because your remark shows you fear contradiction. Just one question, where do you get your information? Al Jazeera? If so, that explains a lot. I dont deny that there are people who are against Bashar. But what you must know is, there are more people with him, than against him. Did you not see the videos i posted up. That was just people supporting him here in Melbourne. How do i know? I was there. In Sydney, there were 4 thousand people showing their love and support for the Syrian President. Not to mention the millions supporting him in Syria. And stop only focusing on the negative things and open yourself to the positives. I acknowlegde that there are people who are fiercely againt Bashar, but i can also see that there are more who fiercely love and support him. And NK, you misunderstood my remark about people never spitting at him. I was referring to the loyal ministers and citizens who Shami belives will turn agaist him. Like i said to him, and now to you, i belive THEY, will never do so. So you wont misunderstand me again, i will repeat… his LOYAL ministers and LOYAL people. The minority of people are those who are against him. There are far more people, whether Syrian, Lebanese etc, who are for Bashar. If the minority want a democracy, they should begin by understanding that in a democracy, the majority rule. Not just here in Australia, but also in America and other democratic countries. So they should be aware that Bashar will remain in power, as long as those who are loyal to him remain so, and they are the majority. Anyway, whatever happened to the US being the most democratic country in the world? The last thing i heared was that a minister or a senator in congress wants to get rid of mosques. (Correct me if i am wrong please, because i do want to know what is really happening at the moment). There’s your democracy for you. And America has been a democracy for at least 200 years. It still needs some work.At least in Syria, Bashar doesn’t want to get rid of churches. What ever happened to the freedom of religion, stated as one of your 27 ammendments? I think it was the first ammendment. Some people need Mosques to practice their religion freely. Even though this horrible suggestion may not take place, it still proves that a suggestion like that is very undemocratic, and too the least, discriminatory. I am not saying that all Americans are the same or agree with that. As a matter of fact i know that the majority, including President Obama, are against it. So you should also consider that only the select minority are against Bashar al Assad. I agree with you. And also, there are more, much more than 50% who are with him. so i think that proves another thing. I would like to correct you, in Sydney Australia, the numbers were too large to hold 1 single Pro Bashar rally, so, there were 2 rallies held on 3rd April 2011. One had 4,000 supporters and the other held almost 3,000 supporters. country, Syrians stood as one in many countries like Armenia, London, Greece, many states in America and the list goes on. Your comments are actually off the wall. How else is a government supposed to gain stability if they do not go directly to the source? If you did not see the news broadcast, there have been illegal weapons found in some of the mosques. I also wonder if you saw the report on the UNARMED policemen sent to protest to keep the peace- as there job description requires, but were ambushed and attacked by these protesters. You question to Australian doesnt deserve to be dignified with an answer. Obviously idiocy is a trait that is aquired at birth by some. What do you think people do when they go to war – they knowingly risk there lives at the request of there government. How many soldiers died in the Gulf wars? What about in Afganistan? You say democracy – I dont believe Western democracy will work in the Arab world – the culture in the Arab world is too different. Saudi Arabia for example still has in the 21st century be-heading as part of it’s capital punishment. They cut limbs and fingers off for minor theft crimes. Women are not to go outside to do day to day activities which we enjoy in the Western world, by themselves, they are to have a male relative with them such as a father, husband or brother. Wake up and take a look around. The Assad regime has done a substantial amount for Syrian citizens since his 11 years in power. He HAS revolutionalised Syria. The late president of Syria Hafiz Assad designed Syria’s political environment perfectly. He kept Sunnis in charge of Syria’s businesses. That was why the majority Sunnis refused to join against Hafiz in the 80’s and now again refused to join the demonstration against Bashar in 2011. It seems that President Bashar has more than 50% supports. This is to include the minorities, people that belong to multi-sects marriages, and good portion of the majority Sunnis (non Islamists). If the minorities and mixed-marriages Syrians equal to 40% it will only take an additional 10% moderate Sunni’s to put him above the 50% mark. I am sure President Bashar did his math before his reform-only-my-style speech. Have you ever heard of a tyrannical majority??? Minorities should not suffer at the power of a tyrannical majority. What happened to ‘government of the people, by the people, for the people'(Abraham Lincoln)? The majority!!!! Ultimately causing injustices to those individuals who are constantly in minorities.